Woodlands and pastoral meadows, as far as the eye can see, introduce this 10+ acre Bedminster estate. Rolling, tended grassland paints a magnificent bucolic tableau and allows for the benefits of farmland-assessed acreage. An extensive driveway passes through arriving at the far-set 20-room brick residence with ever-present views to the serene landscape. Lush plantings shade the paverstone courtyard with terrace at the home's columned portico. Indoors architectural detailing abounds. Hardwood floors are underfoot and light streams through perpetual windows. Sophistication and comfort abound. In the wood paneled library, a spiral staircase rises to its 2nd-story loft. The music room is open to the family room hosting one the home's four fireplaces; its French door opens to a Juliet balcony. Both areas are in clear view of the spacious kitchen with 8-foot island, professional appliances and a magnificent octagonal breakfast area. This window-filled space captures views to the terrace framed with stout limestone balustrade and further afield the sprawling aquamarine pool. The main level also includes a nanny/guest suite with walk-in closet and full bath. Six additional bedrooms take up residence on the second level. Designed with banks of windows, the 7-sided master bedroom enjoys a sweeping view of the grounds. The suite also hosts a sitting room with refreshment station and impactful bowed window wall. A steam shower accompanies the richly appointed marble-clad bath. Vaulted ceilings and walk-in closets selectively prevail in the secondary bedrooms. In total the home offers six full and one-half baths. A full stairwell provides access to the unfinished attic. The finished lower level brings the home's completed living space to approximately 9900 sq. ft. Day lighting and sliding doors opening from the lounge with fireplace to the grounds and pool proffer an engaging ambiance. Here too is a theater, temperature-controlled wine cellar, game and billiard rooms, kitchenette and large office with built-ins. Since the 1800s, Bedminster's residents have included nationally recognized leaders of commerce and government. Within the town's borders are world-class golf clubs. The spectacular Natirar, a former gilded-age estate, is now a sophisticated dining and events venue. Bedminster is also home to The Hills, an upscale housing development which many consider an asset. 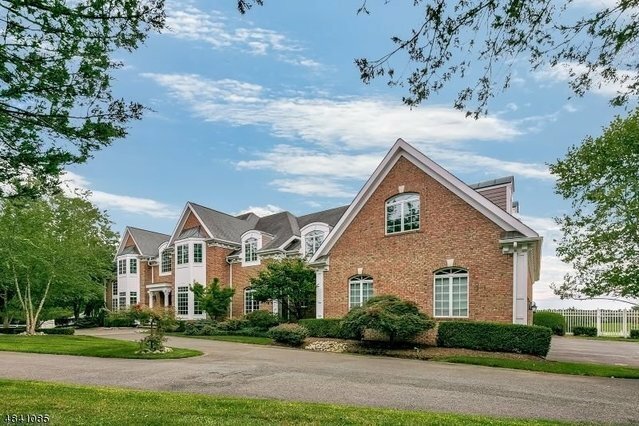 Taking into account its low median taxes, low population density, and impressive school test scores, New Jersey Monthly regularly ranks Bedminster among the State's foremost places to live.And a sprawling pool. Beautifully crafted architectural detailing, oak floors and light-streaming windows abound. Four fireplaces, Juliet balcony, paneled library with loft, full guest/au pair suite, Music rm, family rm and kitchen open to each other the latter hosting an 8-ft. island, professional appliances, octagonal breakfast area. Master Suite includes sitting rm and luxurious marble bath. Additional BRs selectively feature raised ceilings, walk-in closets. Bringing the home to approx. 9900 sf of living space, the walk-out lower level hosts a theater, game areas, lounge, wine cellar, kitchenette, large office.